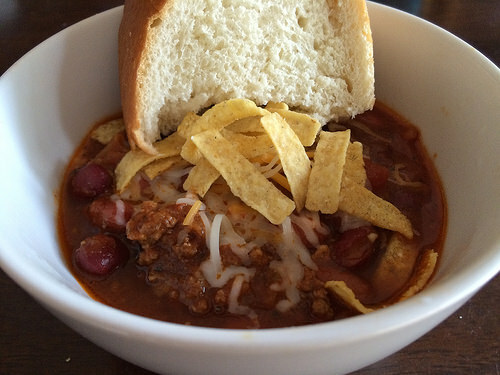 I”m so excited to have Whitney on the blog today sharing one of her favorite recipes Crock Pot Chili! I’m pretty sure we were born with the same stomach as we love to eat! Be sure to follow Whitney for a new fun blog friend! Jen always shares the best recipes and I’m always drooling over her food pictures (which is why we totally made up #stomachsisters, no lie, you can check it out 😉 So in honor of the bond we share over food, I wanted to share one of my favorite Crock Pot recipes for chili. I’m Whitney, Brian’s wife, Kinsey and Brielana’s mommy and human-mom to Stella, a cocker spaniel- dachshund mix. I blog over at Work it Mommy about life as a Girl Mom, preschool activities, Baby Led Weaning, toddler fashion and whatever else tickles my fancy! I’m so glad to be here today, thanks Jen! So, onto that chili! Winter months just beg for a steaming bowl of comfort, am I right?! We eat soup or chili at least once a week at my house. This recipe is super adaptable, I’ve used ground bison instead of ground beef and you couldn’t even tell the difference. I also like to add toppings, because melted cheese and tortilla strips are fun! And o.k, you caught me, dipping french bread into it just seals the deal! This chili recipe is super easy to make and can be customized according to your preferences; don’t want to use ground beef? Sub ground bison. Don’t like kidney beans? Use pinto beans. Any way you make it, it is tasty! Add oil to pan and saute onion and garlic until translucent. Add ground beef and cook thoroughly. Drain fat and add to Crock Pot.Add all other ingredients into Crock Pot. Stir to combine.Cover and cook on HIGH for 3-4 hours or low for 6-8 hours.Serve warm and enjoy! See? Super easy! Plus, both my girls LOVE this chili; I just rinse off the beans using a slotted spoon, is that weird? Hey whatever works! I hope you and your family like this as much as we do! Happy Eating! Whitney, this sounds amazing! And extra points because you can make it in the crock pot. I'm going to have to try it! You know I've never disliked anything I've tried that you've suggested! You are my best "food critic", Liz! You will not be disappointed!!! Thank you for having me, Jen! Hope youre having a wonderful vacay!